My friend Cindy wanted me to have Tanten on "foder" since she needed someone experienced. I think the real reason was to get me to change breed to SPH, she is a rascal my dear friend. That did not work, though i had 4 litters after Cindy got her litter and from Tantens last litter a girl JeanPool moved to Cindy. Tanten moved to Violetta and Zoey a much better home for her since she sincerly hate kittens. Kaidan was born without siblings, at that point i had only Tanten and Melly at home. The thought was to put the breeding to rest so she stayed. My daughter owned her. But she did not get the attention she deserved so she moved. 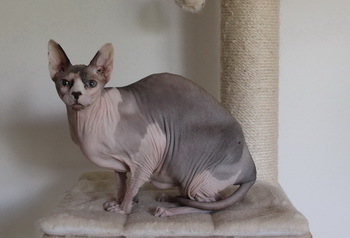 Kaidan is now living a happy life with three other Sphynxfriends. 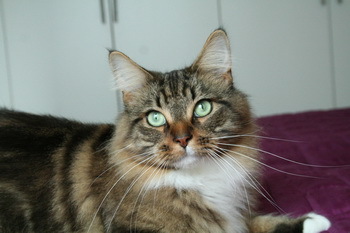 I got a phonecall from Ulrike in Austria, she had a browntickedtabby male avalible! I fell in love i just had to have him and what a boy then, big, heavyboned, beautiful. A temper like a big sweet teddybear. Wille was complete until 6 years of age and was behaving like a charm, would'nt know he was complete. Willie lives with hes former "fodervärdar" in Kungsbacka. 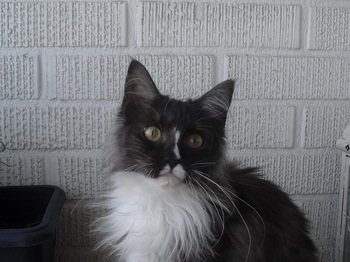 My beautiful Laïka, from the moment she was born i know she would stay! I had Sandra Of-Ivys-Children, on messenger and phone during birth. She was hoping for a female and lucky for us we got to females in the litter so we got one each. Laïka moved as a neuter to my workcollege Daniel, where she now live a fabulus life. Kenny is a heavy boy, who given som really nice offsprings. Unfourtnantly he was marking territory like a sprinkler which made it very hard to keep him complete during a longer time. Kenny is living Simone and her family. How Maya came to me is a long story, she was then 3 years old. It was a wildcat who came, all handling needed workgloves. As soon as you got her she was completely still and nice almost paralysed. It took me 6 month to gain her trust to be handled by me and my family. Slowly she learned to trust us and got used to familylife. Maya got to move after she had to litters and became a neutered, she did not work togheter with complete females and really hated complete males. 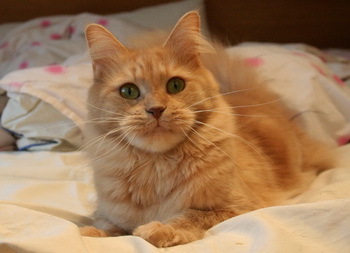 Maya is now living with Linnea as a single cat, she have a wonderful life and is really loved. She will be 15 this year. Athena was N/HCM so i got just one litter of her and continued with two offsprings. 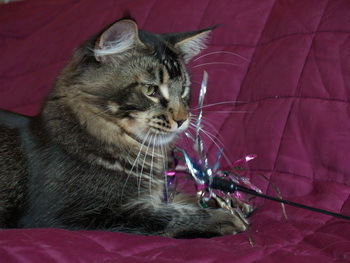 Hathor had to be neutered and Apophis went into breeding and got several beautiful offsprings. 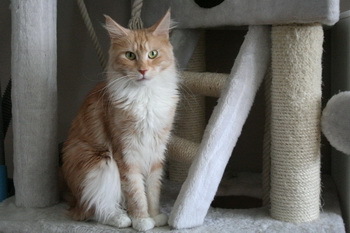 Athena lives with a family and enjoying life as a neuter. 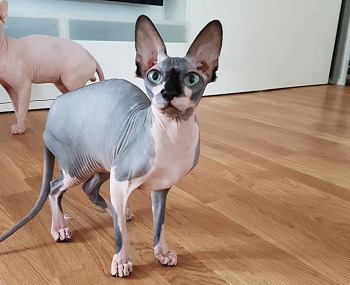 Candy came from Christelle in Sundsvall, she came to me as an adult and got two litters here. She have been given very nice offsprings. 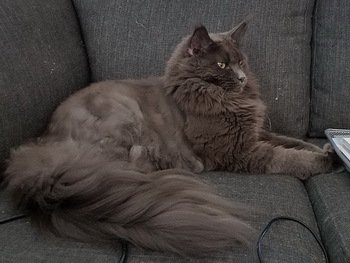 Below is the cat who got neutered without having any litter. Being a breeder is not always a dance on the roses (as we say in sweden) and many times is the disappointment big. 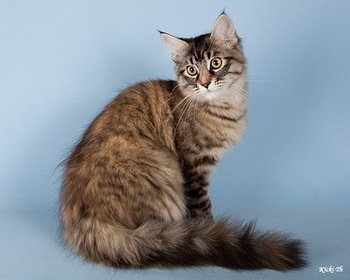 A cat you hoped for and believed in is forced to be neutered for one or another reason. 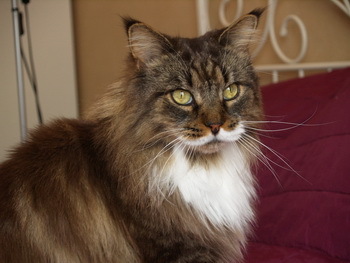 Akiva was rehomed to my daughter Michaela when the previous owners rehomed him. He is a fantastic boy, and is one of the very few gigants today. I think they where bigger 10 years ago then today. 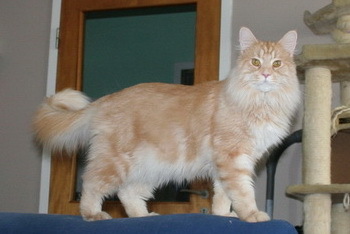 Akiva is son to Willie who came to me from Coonity, he is also a rather large boy. Diva got the diagnos RCM at her second HCM ultrasound I suspect that the reason is her pneumonia she got from bordetella at 8 weeks of age. I will never know for sure. 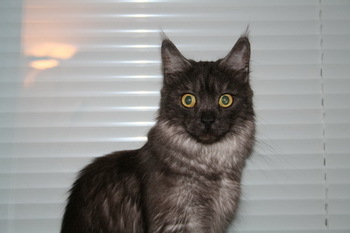 Diva lives with Lucky Rockers, togheter with Lucky To Be Me from the Expression-litter. 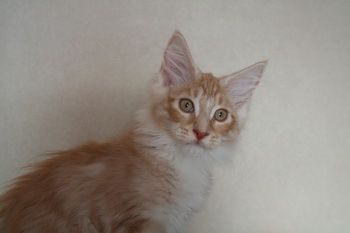 I chosed to save Hathor from the litter i had with Lilleman and Athena she went to a family as "fodervärd". The plan was to take a litter before i gave her to them for breeding in their cattery. Unfourtnantly Hathor developed a spitcyst (not sure about the english word) which was emptied several times. But it did not work and it came back so we decided to let her be neuered. Hathor lives whit Annika and her family. Pigalle my beautiful danish boy with the wonderful green eyes and the warm almost golden color. Pigalle got Equivocal at first HCM UL, at the 2:nd it was status que. We thought he would be ok at third, Torkel thought so, so i kept him complete since he behaved like a charm. Well at third UL, we did have status que on the heart but he had developed a blowsound and got diagnos Mild HCM. Pigall got neutered. Pigalle lives with Daijna just a couple of blocks from here. Triton is a realy heavy nice boned boy. He got neutered since he had HD. 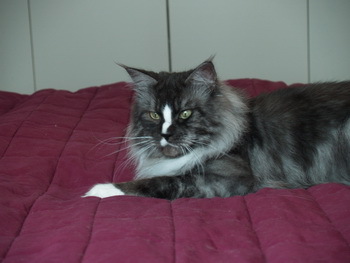 Silvia got neutered without litter since she got the diagnos transitional verterbra from Audell as other diagnos. The impact on a female during pregnancy is unknown. So i decided not to take the risk with her. 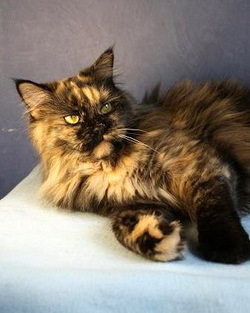 Silvia is a pretty small girl with a large personality and beautiful smoke. 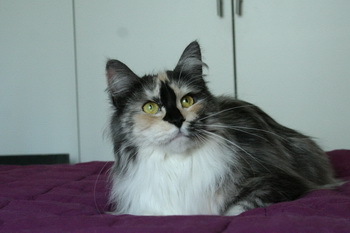 Silvia lives with Anna together with Romy from the Andromeda-litter. Piper was my second MCO, unfourtnantly she got degree 2 on her hip and was neutered. She is a heavy, beautiful girl and a real splasher. Water is her thing. Piper lives with my oldest daughters biological father Magnus, she is still going strong 2019. She will be 15 this year.